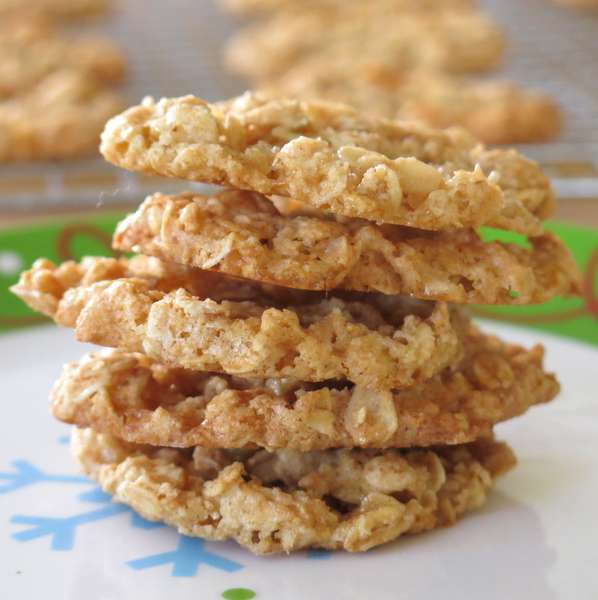 Easy Oatmeal Lace Cookies are light, crispy and very versatile. Whether enjoyed straight from the oven, drizzled with chocolate or sandwiched with a little ice cream in between, your friends and family are in for a delight. There are cookie exchanges. And, then there are super-charged, GINORMOUS cookie exchanges. I made these for the latter…the 2014 Great Food Blogger Cookie Swap coordinated by Julie of The Little Kitchen and Lindsay from Love & Olive Oil. Food bloggers across the U.S. (and some overseas too) received the names of three other food bloggers to whom they sent a dozen cookies. In return, each food blogger that participated received a dozen cookies from three different food bloggers. FUN! I received Bakery Style Brown Butter Chocolate Chip Cookies from NY Foodgasm, Chocolate Chip Cookies from from Sweet Potato Bites and Chocolate Banana Cookies from The Chocolate Cult. Mail time has been just plain, delicious FUN! The best part is we raised money for Cookies for Kids Cancer in the process. This year we raised over $12,000 including matching contributions from brand partners! This itty, bitty teaspoonful of dough…. It’s the perfect recipe for gifting because these cookies are so versatile! Add a few pieces of chocolate to the gift package for the recipient to melt and drizzle over the cookies. Or, these thin delicacies form the perfect outer cookie for an ice cream sandwich. Of course, they are very tasty straight from the oven too! 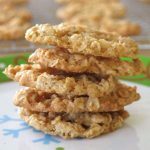 Easy Oatmeal Lace Cookies are light, crispy and very versatile too. Drizzle with chocolate or sandwich a little ice cream in between for a delightful treat. Stir in melted butter and egg. 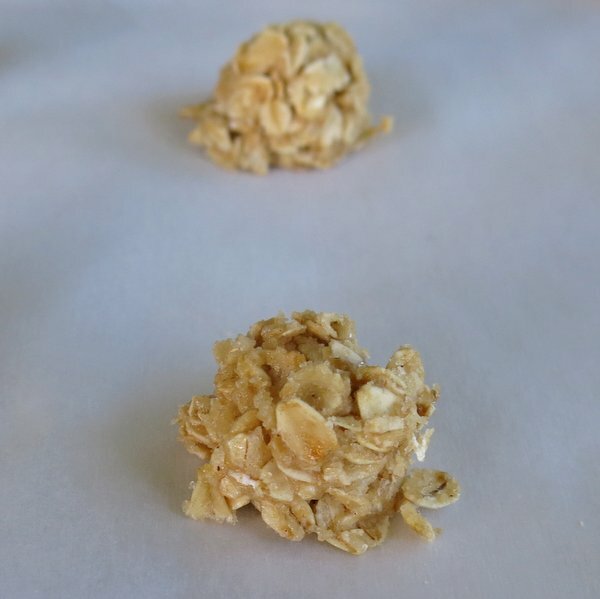 Place 12 leveled teaspoon size drops of batter on a baking sheet lined with parchment paper or a silpat mat. The cookies will spread while they cook so do not crowd them. Bake for approximately 10 minutes or until the sides just begin to brown. The center will still be slightly soft. Allow them to sit on baking sheet for about 2 minutes and then remove to a wire rack to cool completely. My mom and I used to make pecan lace cookies every year, and we’d slather a ton of chocolate in the middle. But they were always really challenging to get right. I definitely need to give these a try, they look much easier and equally, if not more, delicious! I would have a hard time NOT eating every last one of these (I love oatmeal cookies)! 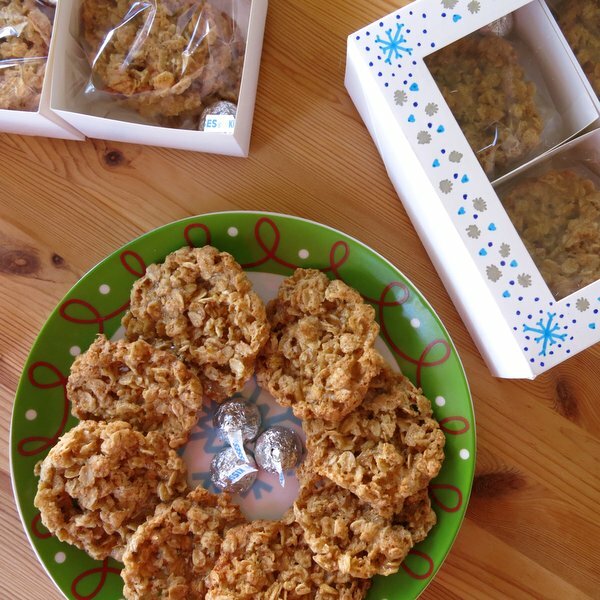 Oatmeal cookies are my husband’s all-time favorites! These are so pretty too! I haven’t made oatmeal lace cookies in ages and now I remember how lovely they are!!! I love simple recipes like this, especially when the end result is cookies!! They’re so pretty. I would love to make some of these and give them as gifts this year! Lace cookies have always been one of my favorite treats, and I love how easy they are to make! I love a good lace cookie. Even better with oats! This is a great idea for those of use who have children with nut allergies! I love a good laced cookie. You can never go wrong with oatmeal cookies. A classic! And I’m especially appreciative of them sans nuts, since my kids have an allergy. Win! Wow! What a baking bonanza!!! 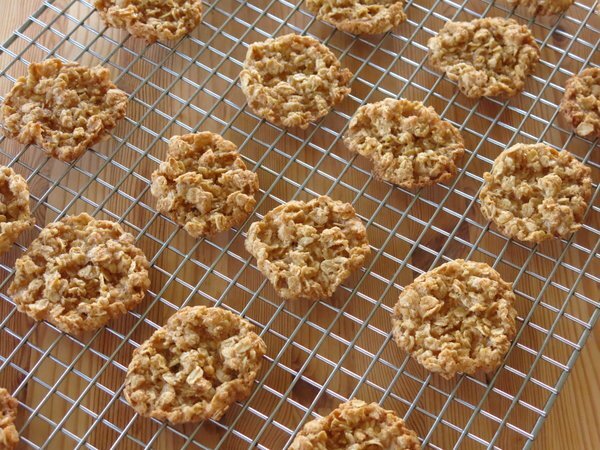 These oatmeal lacy cookies look so good! Oatmeal cookies are one of my favorite kind of cookies, and yours are really gorgeous with their lacy look! These look like the perfect cookies for an afternoon snack! Yum! So crispy, so delicate, so perfect! These DO look like they’re super easy to make! There is just something about oatmeal cookies… yours look particularly tasty! These cookies look absolutely amazing; certainly would have eaten my share without sharing them with the family. This was the first time that I participated in the cookie swap and really enjoyed it. There is nothing like combining fun with doing good. 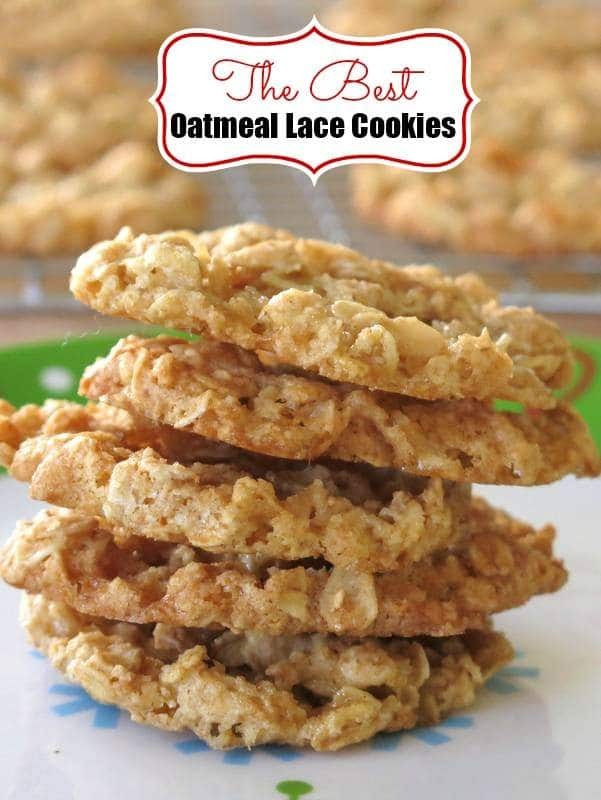 Love these lace cookies especially for the oats in them. In recent years I have been baking cookies for gift giving around the holidays so always happy to collect new recipes. These look so beautiful and yummy great recipe! My type of cookie! And if they are easy, that’s even better. Love this recipe! Followed all the directions. However they were too small and too dry. Made last batch with 1 T of batter. Bigger but still too dry. I’m so sorry they didn’t work out! They are supposed to be fairly crispy. I have to retract my criticism. After they sat for a while they were very tasty and will make again. These cookies turned out super delicious!! I made them yesterday for my mama and I and we loved, Loved, LOVED them! In fact, I about to make some more today. They look and sound delicious and I’d like to try making them with almond flour but wondering if it would noticeably change anything about the cookie. Any idea? Hi! I have not tried this, but it should work, particularly since such a small amount is needed. 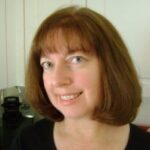 Use the same amount of almond flour – i.e. sub one for one. I found they were immeasurably improved by adding salt. I used salted butter with 1/2 tsp salt, but could use unsalted with a tad more than 1/2 tsp. Salt and brown sugar and these are delicious!